Northlight's DMX merger will accept 2 DMX512 universes and merge them into 1 DMX512 output universe. No complicated setup, basically the board is plug and play. Easy to use screw terminals. The Northlight Systems Merge2 board is capable of receiving DMX512A and legacy versions. Merge DMX universes A and B on highest takes precedence. Merge A and B, where universe B overrides A. Backup mode passes universe A and blocks universe B until universe A signal is lost, then outputs B. If DMX B is not available then the recorded scene is used for backup. 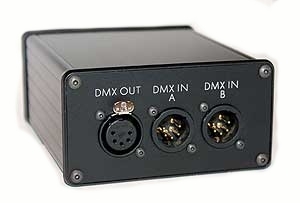 Record a "scene" of 512 channels from DMX B for backup mode. The Start Address is used to determine the position of the DMX B universe, in the DMX output universe. Receives all 512 DMX channels. Does not respond to RDM. 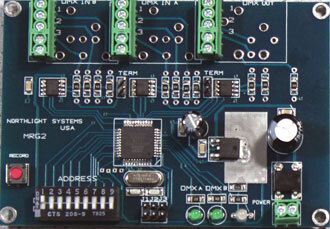 Merge boards can be used as a DMX "fixer". Output is rock steady with timing appropriate for most receivers, also strips RDM data. Low power receiver, equals 1/8 unit load to the DMX date line. Limited slew rate drivers, reduces need for terminators. If you don't have a PayPal account, or don't want one, no problem. Send an email to info@NorthlightDMX.com with your order and we will send a PayPal invoice. A PayPal invoice is an email from PayPal with a link back to PayPal to enter your credit card info. Click in the "Contact" button for warranty info. If you need a power supply or plastic enclosure, click on the Accessories button. If PayPal over charges for shipping we will refund the over payment. We only charge for actual cost of shipping. Size, only 3.95" X 2.75". Input and out on screw connectors, no soldering. Record single scene for backup. Requires 5 - 12 volts DC @ 100 mA, to power board. Shipping cost will be in shopping cart. 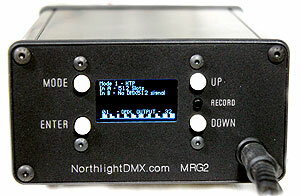 $195.00 - MRG2ENC - Aluminum enclosure . This is not a kit, no assembly required. This is complete, plug and play, no additional parts needed, power supply included. OLED display menu, easy to setup. The OLED menu allows more options than the circuit board. Basic bar graph display of the out going DMX. Records single "scene" of 512 channels for backup. Includes quality UL CE listed, slimline switching wall mount power supply. Includes quality Neutrik 5 pin XLR connectors. comes complete, just like in the picture. Download the quick start guide in PDF format. Northlight offers Priority Mail and Express mail services. Priority mail in the USA is usually 2nd day. Priority mail to Canada take usually 3-5 days to Canadian customs. After that it is up to Canadian customs to process the package. Express worldwide in the USA is next day(overnight). Express outside the USA is usually 3-5 days to the destination country. Then it goes to that countries customs and then their postal service. We combine shipping. Click on your shipping choice only once per order. If you overpay for shipping we will refund the difference from actual cost. Other payment options include Company check, Electronic funds transfer, Western Union and COD in the USA. Email for more information.